What if I’m not a “nice girl” anymore? I have been well trained to be a nice girl. So well trained, in fact, that, decades after that training took place, my body still goes into spasms whenever I even slightly deviate from the “nice girl” rule book. Let me tell you… when you’re raised as a pacifist Canadian Mennonite farm girl, that programming runs DEEP. If we didn’t “turn the other cheek”, then we weren’t living the way Jesus taught us. If we weren’t painfully polite, then we were shaming not only our families, but our whole COUNTRY. If we weren’t sacrificing ourselves for other people, then we weren’t living out our faith. The list goes on and on. Don’t brag about yourself lest you be guilty of the sin of arrogance. Don’t stand up for yourself lest you incite an unnecessary conflict. Don’t let people know how smart you are lest you make other people feel badly about themselves (especially men). Don’t dress too provocatively lest you lead a man to sin. Don’t be angry lest you make other people uncomfortable. Don’t be too bold, too confident, too strong, too pretty, too smart, too obstinate, or too aggressive. Don’t swear, don’t be promiscuous, don’t argue, don’t dance… oh… and… while you’re at it, don’t say no or be rude when an older adult in the family wants to kiss you without your permission. JUST BE NICE. Be agreeable. Be sacrificial. Be supportive. Be demure. Be modest. And… because we’re Mennonites… be prepared to be a martyr for your faith. All of that conditioning resulted in this deeply rooted belief… if you are not a “nice girl” you will not be valued, you MOST CERTAINLY won’t get into heaven, and you will be rejected and shamed by your community. 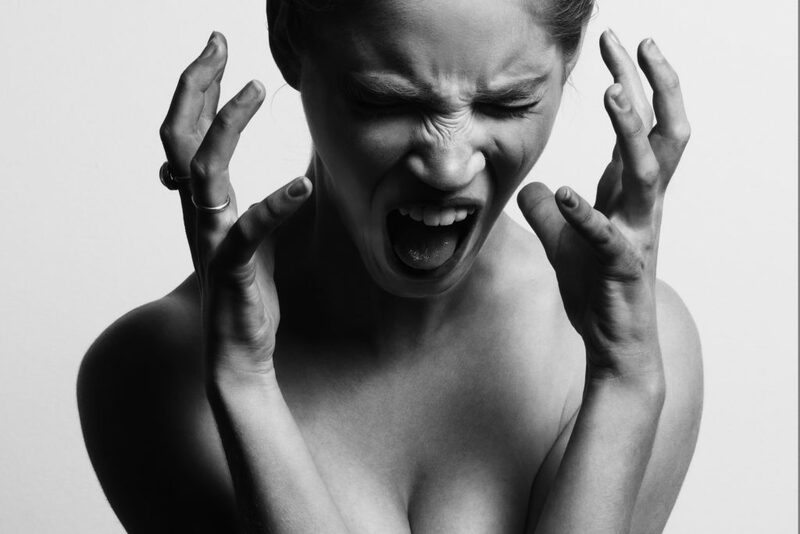 Add to that potent mix the messaging that every woman receives – that if we are NOT nice and we don’t offer ourselves up as shock absorbers for men’s pain, we may run the risk of having their anger and violence directed at us. It doesn’t take very many situations where you experience the truth of that to become convinced that it’s the way the world works. A patriarchal society values nice girls, because nice girls don’t take up too much space, they don’t claim too much power, they don’t challenge authority, and they certainly don’t threaten to overthrow the system that oppresses them. AND because nice girls are so cooperative, they police each other so that nobody else has to do the nasty work of keeping them in line. When I look at all of this objectively, it all becomes so clear, and there’s a little part of my brain that asks “why don’t you just let it go and move on?” LOGICALLY, I get it, and that should make it easy to walk away from that programming and choose another way to live, right? Wrong. Because my tend and befriend reaction gets easily activated when I’m triggered, and because “nice” was so drilled into me as the highest standard and safest way to live, there are many, many times in my personal history when I’ve put up with the infringement of my boundaries (or didn’t bother to have them in the first place), when I’ve sacrificed myself for someone else’s comfort, when I didn’t stand up for myself even though I was being harmed, when I chose to overlook other people’s bad behaviour, when I masked my anger, etc. I’ve sacrificed a lot in order to be nice and it has taken its toll on my body and my emotional health. I’ve done plenty of personal work (therapy, journal practice, art practice, self care, sharing circles, etc.) to overcome that social conditioning and heal the related trauma, and I am far from where I once was, but the work isn’t over. I still get triggered and I still often slip into the pattern of sacrificing too much or overlooking bad behaviour. Recently, as I mentioned in my last post, I’ve had a lot of opportunities to peer into my own shadow, and one of the things that became clear to me was that I needed to do more work to tend to my “psychic membrane” (the language I have adopted to replace “boundaries” – like a cellular membrane, a psychic membrane determines what comes through and what stays out). Some of that work was about allowing more in (joy, nurturing, love, intimacy, etc.) and some was about protecting myself from that which harms me. The problem with strengthening one’s membrane, though, is that it doesn’t always fit with the “nice girl” box that people want to keep you in. It might mean that you indulge in things that might have been branded as “sinful”, for example. And it might mean that, in protecting yourself from what harms you, you show your anger, you offend people, or you look too proud or “full of yourself”. Every one of these times, my old “be nice or lose everything” trauma has been triggered and I can feel my body respond with a need to do something to make it all better and to be nice to people even if they’ve behaved badly. The trauma trigger is NOT the truth and it is not the guide I choose to follow. It is simply my amygdala trying to do its job to protect me from the old outcomes that my body is convinced will result. But I am much more than just an amygdala – I am a person with a strong frontal lobe and with lots of tools that help me shift my brain patterns and calm my body responses. I won’t get it right all of the time, and sometimes, especially when I’m exhausted or emotionally raw, my reactivity will still get the better of me. But I’m learning. And you can too. No, I don’t want to be a “nice girl” anymore. That doesn’t mean I won’t be kind (I have a LOT of patience for people who want to grow and learn and who take responsibility for their mistakes), but I don’t intend to be complacent when people do harm to me and/or people I care about. And I will challenge authority when it is destructive. And I will take up space. And I will work shoulder-to-shoulder with those who want to disrupt systems of oppression. There’s a labyrinth on Whidbey Island that is encircled by tall trees that cast shadows across the path. As you walk the labyrinth, you step from light into shadow and back again. It’s a great metaphor for life. A few weeks ago, I stepped into the shadow. Just before it happened, I said to a friend “before my business grows to the next level, I have a feeling that I need to look deeper into the fears and shadows that are coming up.” Apparently, the universe heard that as a challenge, because since then, it has offered me non-stop opportunities to wrestle with the very fabric of who I am. I have more shadows than I ever knew! Some of my work has been floating all over the internet unattributed (and/or plagiarized) and one of the major websites responsible for it ignores requests (from me and my readers) that they rectify it. It’s triggered my frustration over the casual theft of writers’/makers’/artists’ work and the related difficulty of making a living with what you create. And it made me look deeper into the discomfort I have in challenging those who do wrong. The behaviour of someone who’s been a mother-figure for me in the past brought up some of my leftover attachment wounds from my relationship with my mom. I had to wrestle with where my sense of worthiness comes from and why I sometimes feel an impulsive need to protect and soothe those who serve as mother figures. 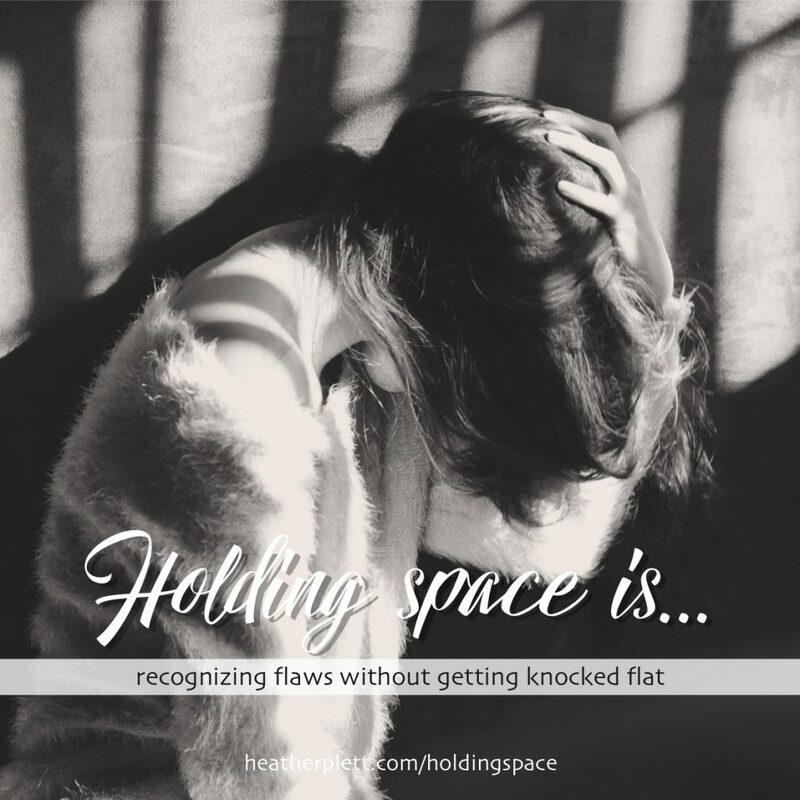 Despite efforts to communicate them clearly and firmly, my boundaries were ignored by a few people in a few different situations, leaving me feeling unprotected and resentful. 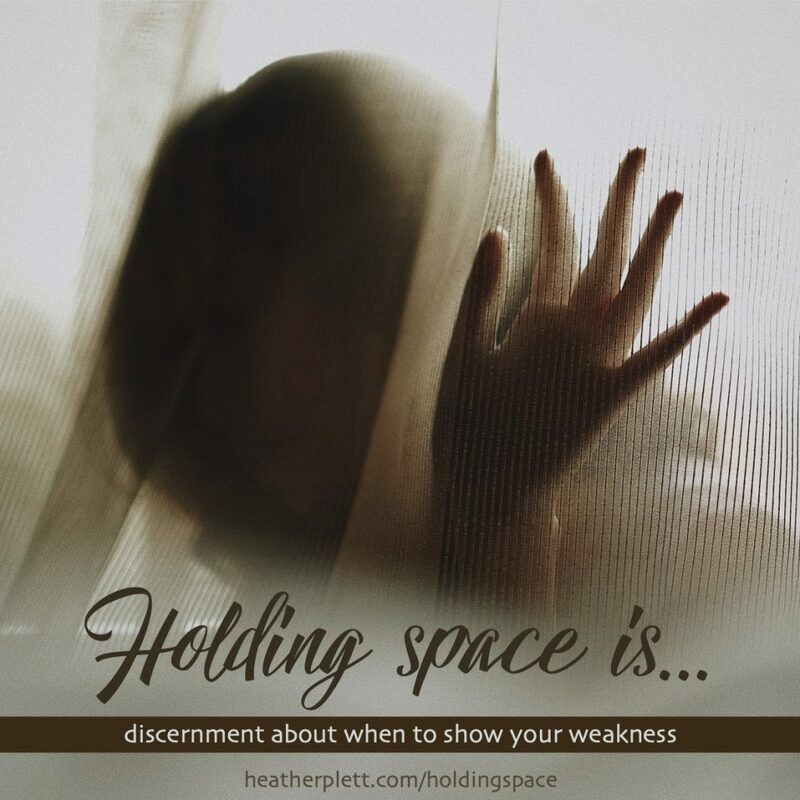 I had to lean into those feelings, be intentional about how I responded to the boundary-crossers, and remind myself that I am worthy of having those boundaries and can survive the reactivity of those who feel offended by them. Conflict bubbled up in multiple circles that I am responsible for and I had to step in to deal with some challenging issues. It brought up some of my “keep the peace at all costs” baggage. I had to summon up the courage to be a conflict transformer and truth-teller rather than a conflict avoider. And I had to invite others to step into the discomfort with me. An angry man in a parking lot (who’d hit me with his car) triggered some old trauma (and my “tend and befriend” trauma response and made me realize the ways in which I’ve been socially conditioned to be a shock absorber for other people’s pain. And then some of the response to the post I wrote about it triggered an old reaction to critique – second-guessing my interpretation of my own lived experience. A couple of people who were once important in my life but have dropped out of contact have become friends with each other, triggering some wounding over being abandoned and left out of the loop. I had to energetically release those people, bless them for the roles they’ve played in the past, and remind myself that rejection has never destroyed me in the past. I’ve had growing awareness of religious trauma syndrome and have had to acknowledge some wounds left behind from leaving the church and choosing a faith with a less authoritarian belief system. When I put it all down into a list like this, I think “Wow! I really went through all of that in just two weeks! It’s a wonder I’m not lying in my bed quivering!” But I’m really not a mess. At this point (though it doesn’t feel like I’m completely back into the light portion of the path yet) I feel strong and clear and even more solidly committed to this work and how I show up in the world. Shadows help us refine our vision and see things we missed in the light. Our pupils dilate and we pick up on nuance and depth we weren’t able to see in the glare of the sunshine. Shadows invite us to slow down, be alert, and be more intentional about how we walk on the path. We have to look more carefully for the things that might trip us up. Shadows encourage us to withdraw for awhile and go inward. We have an opportunity to spend time listening to our own voices and seeing our own truths rather than getting lost in the noise of those around us. Shadows offer us the opportunity to strengthen ourselves and gather our resources for the times when we are invited to step back into the light. Shadows reveal who is truly with us on the path. 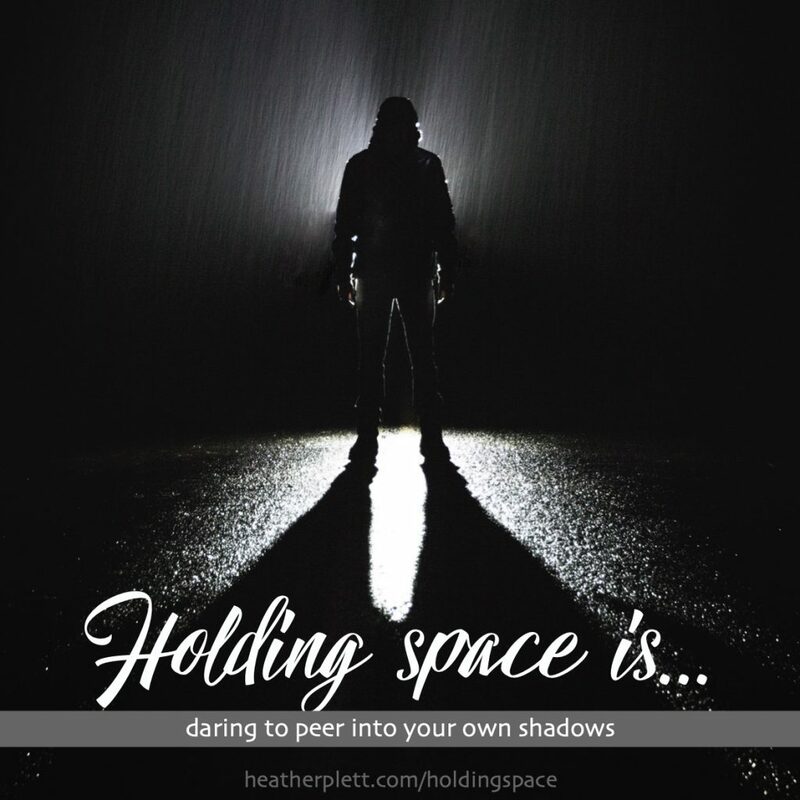 When we are in the shadows, we gain clarity over which friends will truly hold space for us in the darkness and which prefer to be only “friends-in-the-light”. Shadows reveal truth and help us be truth-tellers. When we can speak the truth that the shadow reveals, we cut through nonsense and spiritual bypassing like a knife through butter. When we receive the gifts of the shadows, though, we have to be intentional about how we unwrap them. Though the initial reaction may be to reject those “gifts”, protect ourselves from them, and/or project them onto someone else like weapons, we are much better served when we slow down, let our eyes adjust, and then lean into the darkness. Block out unnecessary voices. I’ve withdrawn from social media this week, recognizing my tendency to use it as a way to numb out and noticing how I am (especially during a time like this) impacted by the noise of other people’s voices. Protect yourself. One of the other things I’ve noticed about social media is how much it exposes me and how I sometimes end up being a shock absorber for other people’s pain. Sometimes I’m strong enough to let it bounce off me, but when I’m in a place of deep shadow work, I need to protect myself from unnecessary shock absorption. Reach out. Though I’ve been off social media, my text messages and Zoom line (and a couple of coffee shops) have been burning up with the deep conversations I’ve been having with those who I trust to hold space for my darkness. Care for your body. Last weekend, I had my favourite body treatment (hammam spa) and I cried my way all the way through it. I hadn’t known just how much I needed to release from my body. Walk it off. Unfortunately, we’ve been stuck in a deep freeze this week, and I’m a winter wimp who doesn’t like to have my face bitten off by the cold, but my treadmill has seen a few miles as has my yoga mat. “Konmari” your work and life. I’ve been doing some cleansing, recognizing where the energy leaks are and what no longer “sparks joy”. I’ve cleared a few things off my website and removed myself from the networks and associations that no longer feel like the right fit. And then I processed the grief that some of that brought up. Write your truth. My journal has been my best friend these past few weeks, and, as always, some deep truth has shown up on the pages. It’s helped me clear out old stories and claim new truth. Tend to your psychic membrane. In my teachings on holding space, there’s a fairly new concept I’ve developed about how we each have a psychic membrane that, like a cell membrane, helps us determine what to allow in and what to protect ourselves from. I’ve been working on strengthening mine and paying attention to the signals it sends. Honour your own hard work. Whenever I do work that I’m especially proud of, I reward myself in some way – buying myself a new piece of jewelry or other treat. I do that for both my external work and my internal work. I haven’t done that yet (because it doesn’t feel quite finished yet), but I plan to. Laugh. Comedy shows on Netflix have helped me not to take myself too seriously. Make messy art. I bought a large canvass and have been doing some intuitive art-making, combining elements that represent some of the shadows I’ve been peering into. For example, I added paper dolls that were my mother’s and mine. I look forward to stepping out of the shadows and back into the light. When I do so, it will be with a strengthened sense of self and a stronger psychic membrane to protect and nurture me. When I teach about holding space, I almost always start by teaching about liminal space. 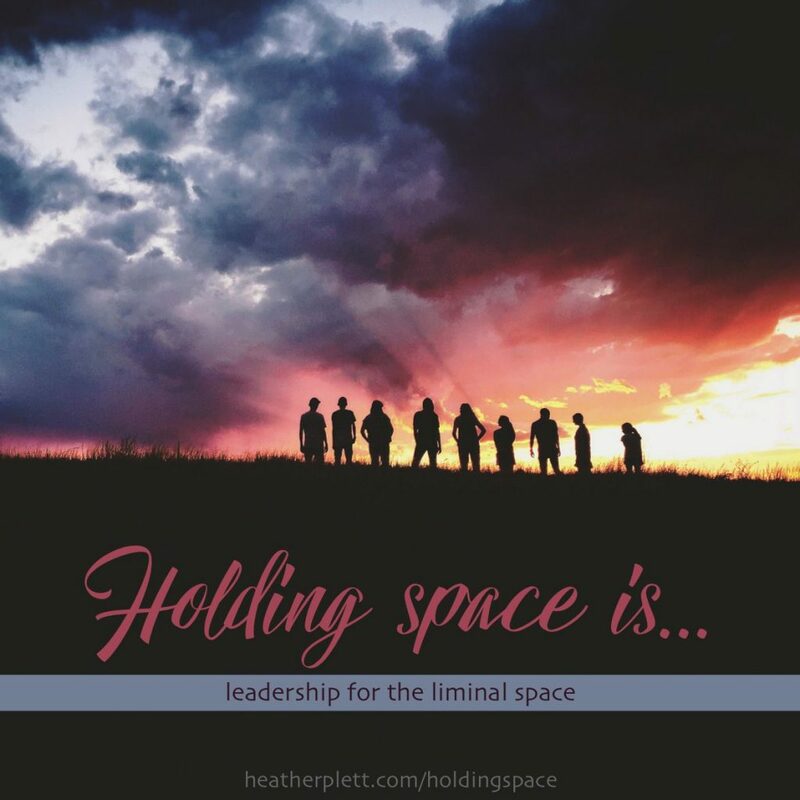 It helps participants to have a more clear understanding of the depths and complexity of the space they’re holding and the space they must journey through themselves. Liminal space is the space between stories. It’s a term that emerges out of an anthropological study of rituals that mark a person’s transition from one part of their lives to another. The “limen” is the empty space between who they once were and who they are becoming – like a vision quest for a young person going through a coming-of-age ceremony, for example. To illustrate the liminal space, I talk about the cocoon phase of a butterfly transformation – it’s the empty space in the middle in which the contents of a cocoon looks like neither the caterpillar nor the butterfly. It’s a space of surrender, ambiguity, and usually a sense of lostness. The more I teach it, though, the more I realize the limitations of this metaphor, largely because of the linear, goal-oriented transformation that it points toward. The intent of the cocoon is always to produce a butterfly. A butterfly is always the sign that the liminal space journey has been a “success”. There is always (unless the cocoon is destroyed) one direction with one outcome in this transformation. But what about when the liminal space journey does not result in a lighter, more beautiful creature that can fly? And what about when the liminal space emptiness becomes the pattern for the rest of a person’s life? Does EVERY liminal space bring a new story of freedom, flight, and beauty? The answer is no. Life is never that simple. When a person is aging with dementia, for example, there is diminishing capacity and less and less freedom. And when a family member has gone missing or has gone to jail or become addicted to drugs there is no resolution and rarely a happy ending. And when a refugee leaves a beloved homeland and can never return, they live with a lifelong yearning for what cannot be reclaimed. And when a person must learn to function in a wheelchair they know they’ll be in for the rest of their life, there is loss of mobility, autonomy and access to the things they love to do. None of these things offer a simple, linear destination. Life is always more complex than a simple metaphor can reflect, so we take from it whatever it can offer and then look beyond it to find more complex truth. What is undeniable in these situations of ambiguous loss, even when the “after” story is much harder and more bleak than the “before”, is that there is some kind of transformation. A person’s life has been irrevocably changed. Even if the period of ambiguous loss ends (ie. a member of the military returns from deployment) there is change in the relationship and change in the individuals involved. I remember, for example, a friend who was married to a member of the military who said “When he’s deployed, I have to get used to him being away, and then when I’m finally used to it, he returns and I have to get used to THAT. Whenever I get used to something, it changes.” Her new life was one of impermanence and cycles of loss. If only we could simply serve as cocoons when we hold space, knowing that a person will emerge better, stronger, and more beautiful after the liminal space journey. If only we could always bring hope to this work and not despair. If only life were more linear and less messy. But if that were the case, I’d have to find other work, because little of what I teach would have any relevance. This work is only relevant BECAUSE the future is unclear and cocoons don’t always result in butterflies. It’s about letting go of the outcome. 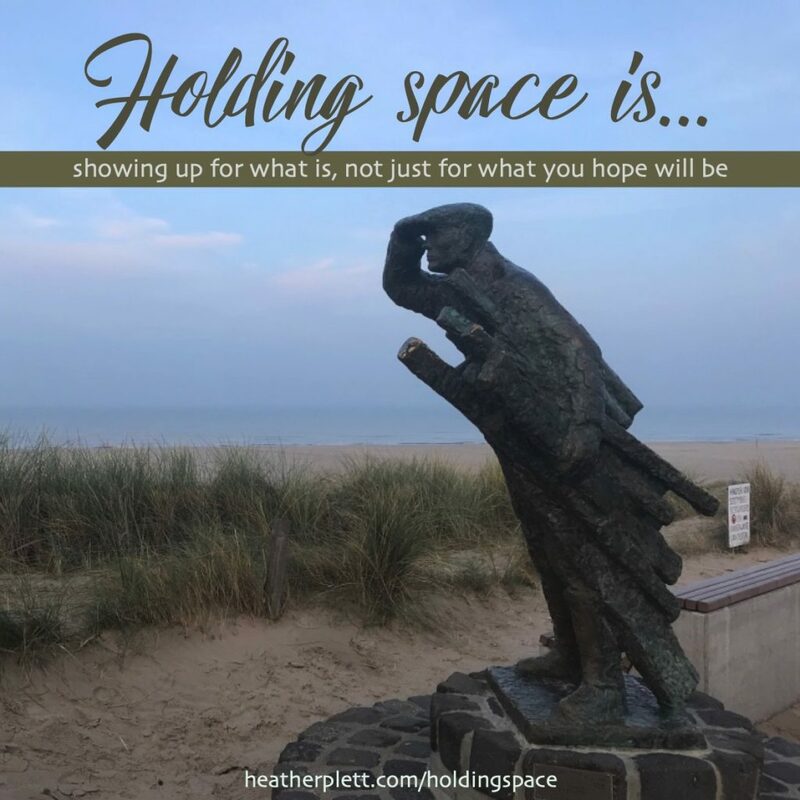 It’s about showing up even when the grief is deep and messy and there is no happy ending. It’s about surrendering rather than controlling. It’s about learning to accept the non-linear nature of all of our lives. When life gets messy and you are in a relationship in which you’re holding space for someone who’s experiencing this kind of complexity and ambiguity, here are some things to keep in mind. Don’t try to fix the grief. Whether it’s a loss of mobility, the absence of a family member, or the loss of one’s country, there will be grief involved, and it may be messier and stay around longer than you anticipate. Someone who’s been displaced from their country, for example, may grieve that loss for the rest of their life. A comment like “at least you’re safer here” doesn’t help to diminish the loss. Support (but do not impose) meaning-making. As Viktor Frankl teaches in Man’s Search for Meaning, those people who find meaning in hardship and loss (in his case, concentration camps) have the greatest ability to survive and thrive in spite of it. When, for example, someone who lost a family member to drug addiction uses their experience to support others on the same journey, it can help them to not drown in the grief they still carry. But don’t try to make meaning for them – they have to arrive at it in their own timing. Practice mindfulness as a way of letting go of attachment to the outcome. A mindfulness practice of some kind (and I give no prescriptions, because it looks different for everyone) teaches us to notice what is present and then to release it without judgement or attachment. One of the mantras I adopted early on is this work that has sustained me through many moments when I desperately wanted control is “The outcome is not my responsibility.” Show up for what’s needed in the moment, and let the rest go. You are not God. Keep showing up. Many people, when they experience great loss, disability, chronic illness, etc., also experience the loss of friendships. The relationship has changed because the things that you can do together may have changed, or you don’t know how to be present in a situation that you can’t fix, or you’re afraid of doing or saying the wrong thing. Your own fear of change or the loss that you have experienced because of the change in your friend makes it hard to show up. But your consistent presence may be one of the things this person relies on to help them survive this liminal space. You may not know what to do or what to say, but your presence often speaks louder than words. Don’t lose your sense of humour. Of course, you don’t want to make inappropriate jokes at a funeral or at someone’s hospital bedside, but there’s also a good chance that your friend needs you to bring some laughter into the space. A sense of humour helps to build a resilient spirit, so don’t be afraid to laugh with a person who may be tired of all of the sombre people they’re suddenly surrounded by. They will likely appreciate the normalcy of it in the middle of what feels like an upended life. This is far from a perfect science. There is plenty of ambiguity and each situation is different. Each person is different, too, so the best you can do is to be humble, offer what you can, and let love be your guide. For more on this topic, I recommend this podcast on The Myth of Closure, with Pauline Boss.